Mission: We have a continued commitment to improve/protect our cold water resources and to be involved in the community. Our projects with the DNR and US Forest Service are in Oconto, Langlade, Marinette Counties and the Nicolet National Forest with emphasis on the Oconto River Watershed. Chapter meetings are held the first Tuesday in months of February, April, June, August, October, and December at The Lone Oak Gun Club Hwy 32 just north of Gillett. Lunch is served at 6:30 pm-Meeting starting at 7pm. After meeting - Presentation and Prizes. Next Newsletter will be mailed 3rd week of May. You may contact anyone of us for information. Another web site that is very interesting is www.lake-link.com. National TU offers chapters an incentive to recruit new members locally. This program allows our chapter to bring in first time members for $5 during the full year. So now is the time to get your sportsmen’s neighbors and friend to join the chapter. Just mail a check to chapter address and we will take of the remaining paperwork. Social and Raffle time 5:30 pm, Dinner 7:00 pm. Tickets $35, Sponsors $100 and $200. Each Sponsor of $100 receive 2 Dinner tickets and opportunity to win (1 of 3) $500 Cash Prizes. If you have any questions about tickets or wish to contribute an item or merchandise, please call Tom Klatt 920-621-9266 or email us by selecting "Contact Us". We would appreciate items for our Silent Auction. 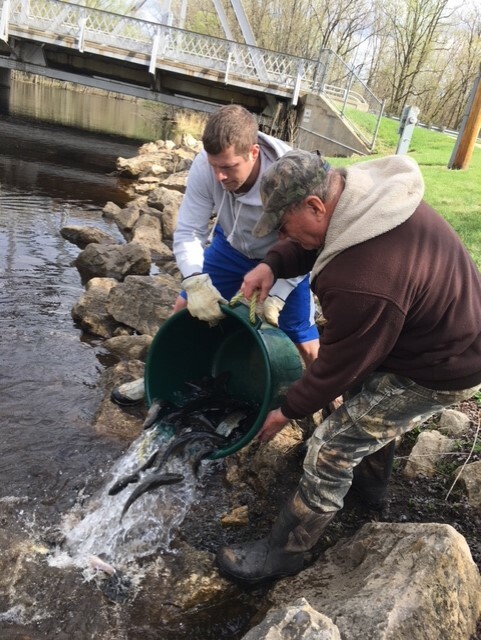 Last Spring the Oconto River Watershed Chapter of Trout Unlimited partnered with the Breed Sportsmen’s Club, Oconto County Sportsman’s Alliance, Suring Sportsmen’s Club, and Underhill Sportsmen’s Club to fund trout stocking in the main Oconto River. In addition, several individuals also continued to the project. The feedback response to this project was very positive and consider a great success. Some area fishermen reported catching some nice trout from Suring south to State Hwy 22. It was nice to see more fishing on river than previous years. This is the Class 2 section of river the TU Partnership stocked over 930 lbs. of 10 -13 in Browns and Rainbow trout. With the success of last year, Project Go Trout Fund 2019 is our focal to raise funds to do another stocking event this year. The stocking would occur when the spring weather allows truck to reach all stocking sites at public landings south of the South Branch at Suring and continuing downstream at landings in Hintz, Underhill and Pulcifer. The Chapter has started the fund with $1,000 seed money and donations can be mailed to Chapter address and please note funds for trout stocking. If you have questions on anything, please go to web site ocontorivertu.com and select “Contact us” to send a message. Thank you for what you do for TU. First time new member Nick Klitzka and Jeff Zarling were among the 27 members in attendance. Banquet update, prizes have been purchased, ticket orders are still coming in, still need volunteers to assist and silent auction prizes are always welcomed. Jim Zitler’s name was drawn from winter fishing contest entries and won a $25 Cabela’s gift card. In the Trout in the Classroom update, Dale H. said that White Lake ran into some issues, and Klint H. reported that a leak at his school’s tank resulted in a complete loss, Suring donated some of its fish and they are growing rapidly. The bench in honor of Don Wagner was selected by his wife Judy along with DNR approval and will arrive mid-May. A dedication date will be determined later. The May stream project will be at the barrier-free area of the South Branch of the Oconto River. A meeting place it to be determined. A motion was approved to accept the board members changing the length of term for officers from one year to two, limiting presidential service to two consecutive terms and adding a second vice-president. Chapter officers were elected for 2019/20: Wayne C. (president), Dean S. (vice president), Dale H. (second VP), Pete V. (secretary), Dave K. (treasurer). The Board of Directors will consist of Jim T. (through 2020), Bill W. (’21) and Howard K. (’22). Planning is going forward for the Family Fishing Day and fish fry scheduled for Saturday August 10 for members and visitors. Klint Hischke thanked the club for the TIC program, noting how it was an important step towards the greenhouse and aquaponics center at the Menominee Tribal High School in Keshena. Dave Kalous was awarded Member of the Year for 2018 for all his involvement.